Annabelle will return to haunt your dreams in 2019. According to The Hollywood Reporter, New Line has ordered a third film surrounding the creepy doll, with Gary Dauberman, who wrote the scripts for 2014's Annabelle and 2017's Annabelle: Creation, taking on directorial duties. Dauberman, who will make his directorial debut on the film, is once again set to pen the screenplay. The third Annabelle film is being fast tracked by New Line, with a July 3, 2019 release date already set. This will make 2019 another big year for Dauberman; he is also set to pen the script for It: Chapter 2. Dauberman, who is currently working on a script for an Are You Afraid of the Dark? movie at Paramount, is also known for writing Within, Wolves at the Door, and It. 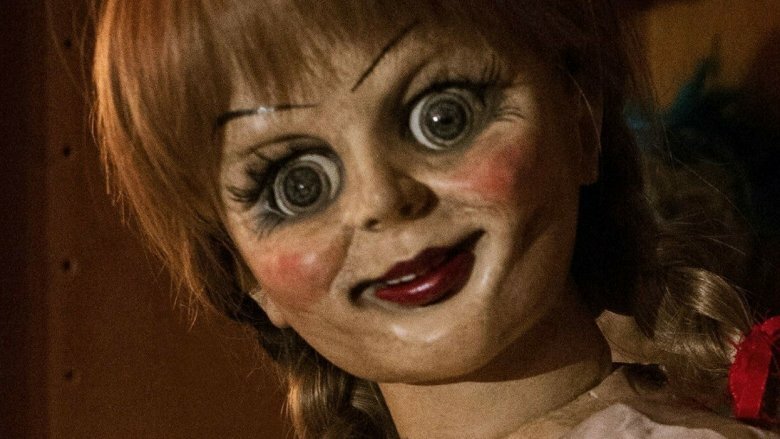 James Wan's Atomic Monster and Peter Safran Co., the studios behind the whole of the Conjuring franchise, are set to produce the third Annabelle film. Thus far, the low budget horror franchise has managed to pull in over $1 billion at the worldwide box office, making it one of the most profitable horror franchises of all time. The franchise is already set to get another terrifying entry in 2018 with The Nun, starring Taissa Farmiga and Demian Bichir as two people haunted by the terrifying nun introduced in The Conjuring 2. Dauberman also wrote the script for that film. Also in the works are The Conjuring 3 and another The Conjuring 2 spin-off, titled The Crooked Man.